Ahhh.. .dating in the digital age! Lucy Brown, of London, went on a date a couple weeks ago with a guy she met on Plenty of Fish, a dating website. When he called to ask for a second date, she told him that she didn’t think there really was a future in any further dating. 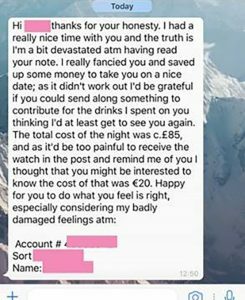 A couple days later, she was a bit surprised to receive a text from him, that basically billed her for half of their date. She paid up, but got the last laugh as well, when she donated the same amount of money to a donkey sanctuary in his name!